Air Temperature Service LLC is proud to serve the Hopkinton community! About Hopkinton, MA - Happy to be your hometown Heating & Air Conditioning Contractor! Hopkinton, MA is a Massachusetts town located in Middlesex County. According to the 2010 census, the population was 14,925, and the town is best known as the starting point for the Boston Marathon. The town was incorporated in 1715, and it was named after Connecticut colonist Edward Hopkins. There are 215 properties listed in the State Register of Historic Places, the most of which are found within the Cedar Swamp Archaeological District. 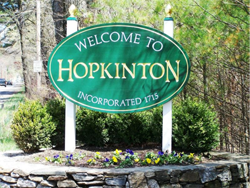 The town of Hopkinton is part of a continental climate that includes warm and humid summers with winters that typically see snow, wind, and cold temperatures. Attractions found in Hopkinton are varied. History enthusiasts may enjoy visiting the Hopkinton Historical Society. Sports lovers may enjoy the Patricia Brosnihan Dance Center or the Hopkinton Swim Club. Finally, nature enthusiast can explore the outdoors at Hopkinton State Park and other natural areas.